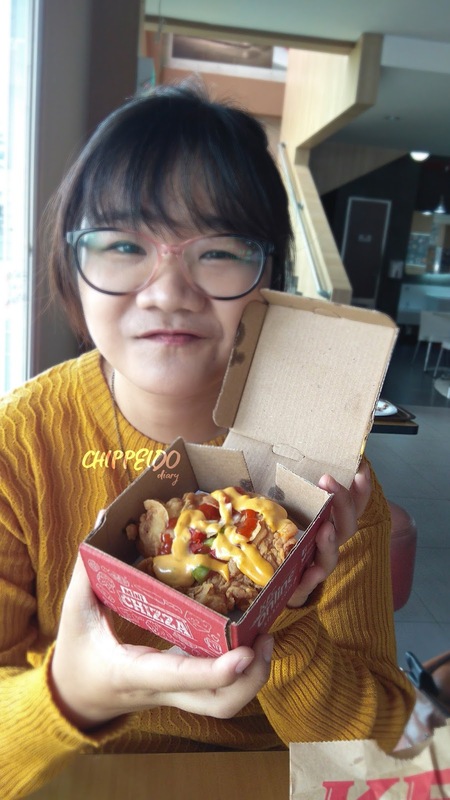 Chippeido: (Review) MENU BARU KFC!! : Si Imut Mini Chizza, WHAAAT?! (Review) MENU BARU KFC!! : Si Imut Mini Chizza, WHAAAT?! Yo, whatsupp!! Hi, foodies gimana liburan kalian kemarin? Pasti sekarang sudah banyak yang mulai kembali pada rutinitas sehari-hari seperti sekolah, kerja, dann sebagainya, ya kan? Well, as a college student my holiday and my routine was the same. CODING!! Yeahhh.. Until tomorrow I'm still on duty because tomorrow was the d-day of my LAST FINAL PROJECT and I'm so excited yayy. Actually last Saturday was the last frighteningful day because although the deadline still tomorrow but we have no time to consult anymore 😢😢. So, yeah. Yesterday I decided to refresh my mind and go hunting. Meanwhile remembering that instagram now full of 'that kekinian' pictures, then.. I went there, to KFC. The left is my favorite Chokocha. It's a matcha blended with chocolate and an ice cream on the top. Although somehow yesterday's chokocha tasted a bit weird but this is the must ordered beverage when I go to KFC. The right one is Twisty, the must ordered snack/meal at KFC because it tasted soooo yummy and a bit more healthy than others because it wrapped with tortilla and consist lots of vegetables which are good for our metabolism because of its fiber.